This is 3-rd. 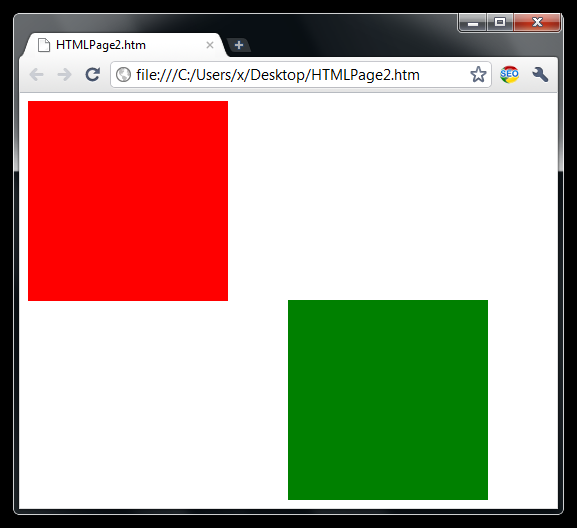 article from the tutorial “CSS website design using divs” explaining the CSS position keyword. 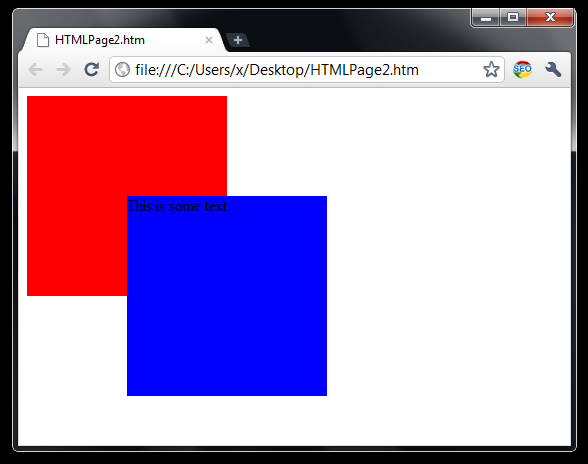 CSS layout for divs is all about positioning and floating. First notice that position can be either: absolute, relative, fixed, static, or inherit — where the default position is always static. Let’s start with the absolute position. Now you may notice that the container div C and the child div A are both positioned absolute. 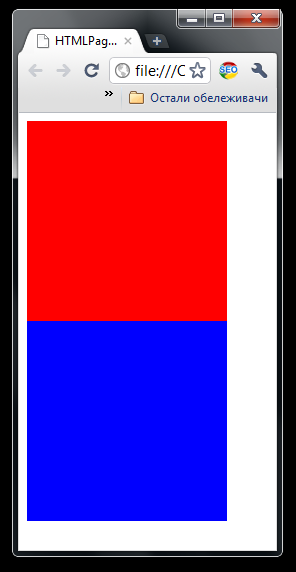 Let’s remove the position:absolute from the div C.
Ups, the green rectangle is no longer positioned relative to it’s div parent C, but relative to the browser viewport. The master tip here for the 2 divs to be positioned absolute, the container div must have the position absolute or relative else the absolute positioning won’t work. Per purpose I’ve set the position relative after position:absolute because I wanted to show that relative position always works for the child and it’s DOM parent object. 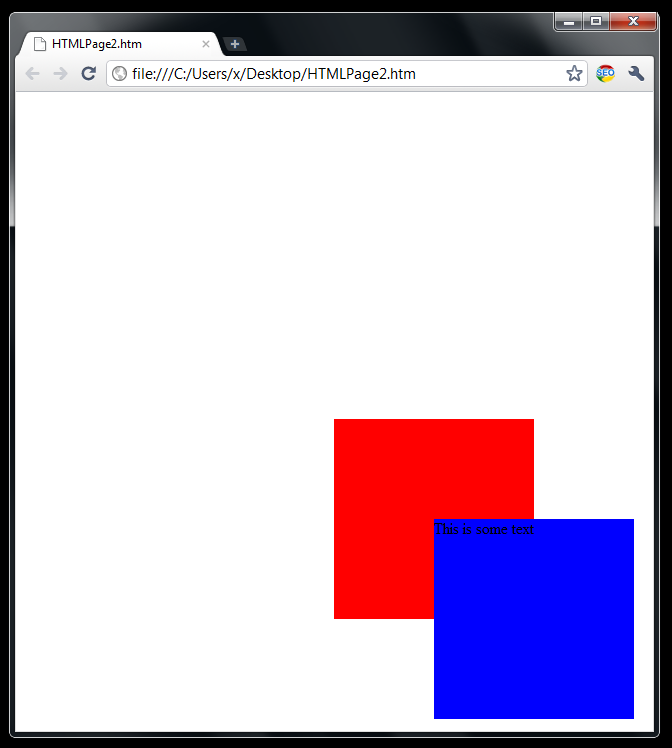 I’ve set the 2 divs: div C — that is a container and the div A that is a child. The div A has position:relative set and that position will always work in respect of A’s parent element. Let me show you the another example. Now the container div C is relatively positioned to the center of a browser, and the div A is relatively positioned to C.
The master tip here is the child div A will be positioned relatively to its DOM parent object C no matter how parent object is positioned itself (absolutely or fixed or any other position). 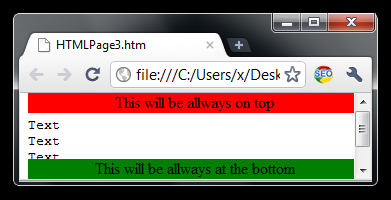 Position: fixed concerns how a single div is positioned relative to the visible browser area. I will just show you this effective example how it can be used. 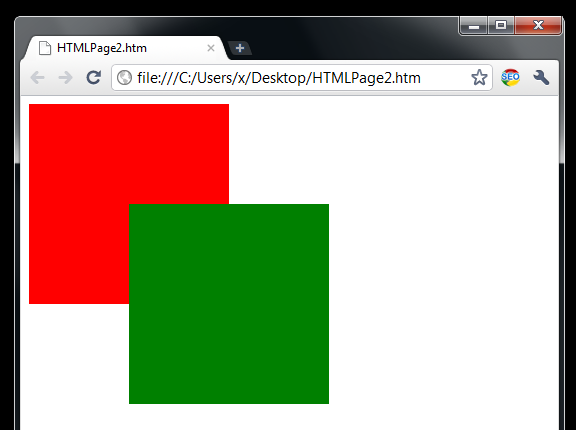 No matter what ‘s on the page the 2 divs will be always in the visible browser viewport. For the divs static positioning is by default. In this example div C and A are siblings and there will be no overlapping nor in-lining. Divs are block level elements — which means that they will start in a new line. You may notice that div C’s red color is completely overlapped. Actually this is quite cool and this is what we will use because we want the div C as a placeholder for other divs. In the next article I will continue with the position: static and I will introduce divs floating, because divs floating works together with position: static (typically it is allways used with position static). Summary: We noted first the distinction between absolute and relative position. Then we showed the example for the fixed position and we ended with the 2 most important static position examples. 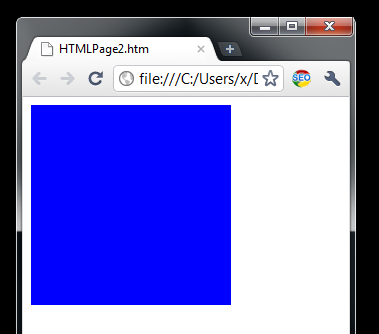 How to set a div in the center of a web browser using margins?